« Earn Money Teaching Chess to Children in After School Programs! The upcoming World Championship Chess Match against Viswanathan Anand is not Vladimir Kramnik’s first chess match in Germany. In July of 2000 Kramnik played another high profile match in Deutschland. This time his opponent was the highly touted computer program Deep Junior. 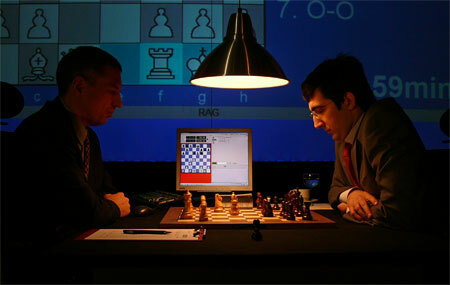 Because his opponent was a computer, Kramnik used anti-computer strategy that would not work against someone like Anand. This does not take anything away from Kramnik’s achievement in the game below. His play was nothing short of brilliant. Playing 2. e3, Kramnik is obviously playing a slightly inferior move to take the computer out of its opening book. Kramnik’s strategy is to eliminate any opening advantage the computer may have and then lock up the pawns to reduce the computer’s calculation advantage. Kramnik then will use the human advantage of being able to form a long term plan to set up a position that favors the human. Its amazing how coordinated Kramnik’s pieces become after 23. Bd1. His bishop, 2 rooks, queen and knight are all focused on Deep Junior’s king. In contrast, Deep Junior showed little understanding of what was happening when Kramnik played his 12, 15 and 18 move. Becuse of this lack of understanding the aspects of the advancing pawns in a closed position, Deep Junior’s pieces are caught in the wrong locations late in the game. After 25. e4 Kramnik unleashes his dark square bishop thus using all his pieces together in the same attack. The rest of the game Kramnik plays with the great accuracy that is needed to defeat a strong computer opponent. This entry was posted on September 27, 2008 at 5:30 am and is filed under Anand vs. Kramnik, World Chess News. You can follow any responses to this entry through the RSS 2.0 feed. You can leave a response, or trackback from your own site. This will be one great match,both are worldclass super gms, its like a chess version of boxing match between Joe Fraser and Mohamed Ali.